24 Truly, truly, I say to you, whoever (1.) hears my word and (2.) believes him who sent me has eternal life. He does not come into judgment, but has passed from death to life. Apart from Jesus, the Son of God, and God the Father, we are already dead. We are dead in our sin. We are born sinful – without the Spirit of God in us and without the presence of God with us. Psalms 51:5 Surely I was sinful at birth,sinful from the time my mother conceived me. We are dead. There is no true or real life in us. BUT Jesus made a promise! He promised life – everlasting life! To receive this promise, He says we must do two things: 1.) Hear, and 2.) Believe. When we hear and believe, we can today have life – new life, everlasting life. Also, this everlasting life, this new life doesn’t start when we die. It starts now! As we notice in verse 24, Jesus is speaking in the present tense. He is not speaking about something that will happen in the future. If we hear and believe today, we can have everlasting life TODAY! Everyone will one day hear His voice and have a chance to respond. Knowing that not everyone will believe, Jesus says that those that do hear and believe will live. Psalms 65:2-3 You who answer prayer,to you all people will come.3 When we were overwhelmed by sins,you forgave our transgressions (wrongdoings). Let us rejoice and celebrate! For if we have heard and believed, we have a new and everlasting life! 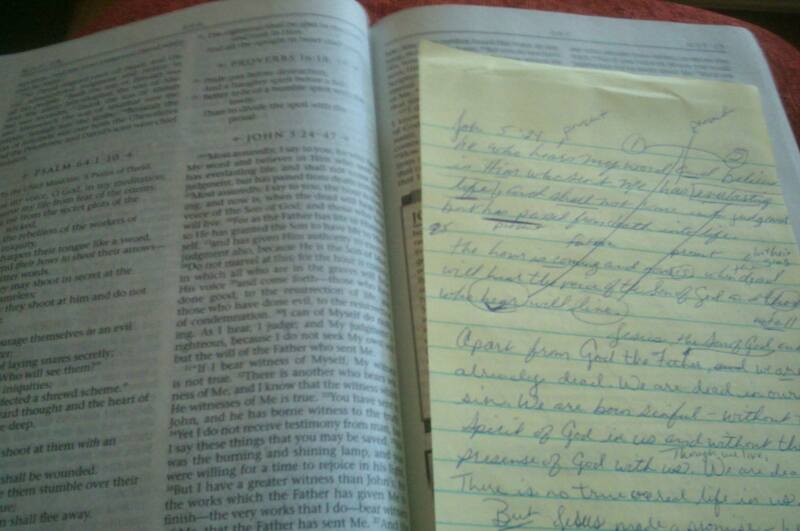 This entry was posted in Bible Study, Daily Reading and tagged believe, everlasting, hear, jesus, life.